Scrappers is a game for 2-4 players. 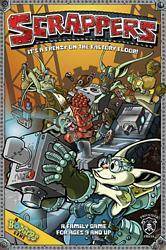 Each player takes control of a single goblin mechanic and uses a hand of action cards to race around the factory conveyor belt in order to grab the parts they need to finish their contraption first. The action cards drive the game play and present players with lots of different movement options on their turn, from jumping over the conveyor belt or another goblin to reversing or advancing the conveyor belt and the parts on it. While the luck of the draw determines what cards you have to play, using your movement options to best effect will challenge even the canniest of players. At the end of the turn players take the part in front of their goblin and add it to their contraption. There are two different types of parts players can grab, plugs and cores. A complete contraption will consist of 4 plugs and one core that share matching connectors. Watch out for rival goblins though, as you may find yourself tussling with your opponents for that coveted part! The first player to build a complete contraption with his parts wins the game!